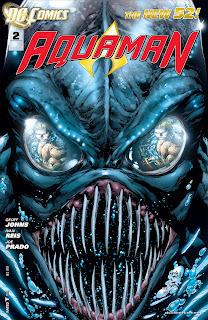 Aquaman #1 was one of my favorites of the DC relaunch. #2 did nothing to disappoint me. Johns continues the story by showing us some scenes from Aquaman's youth. Mera wants to try the different things that she sees in the pictures. The action ramps up this issue with the assault on the surface by the denizens of "The Trench" (seen on the cover). The action is all out as Mera and Aquaman show their powers as they are attacked by the masses of "The Trench" creatures. It appears that the creatures are searching for food. Unfortunately for the inhabitants of this small sea side community, humans are on their menu. The next issue blurb says that we will learn the secrets of the Trench. I can't wait to see what Johns has planned. Reis and Prado turn in another great art job. Hopefully they can keep pace with the monthly publication level. 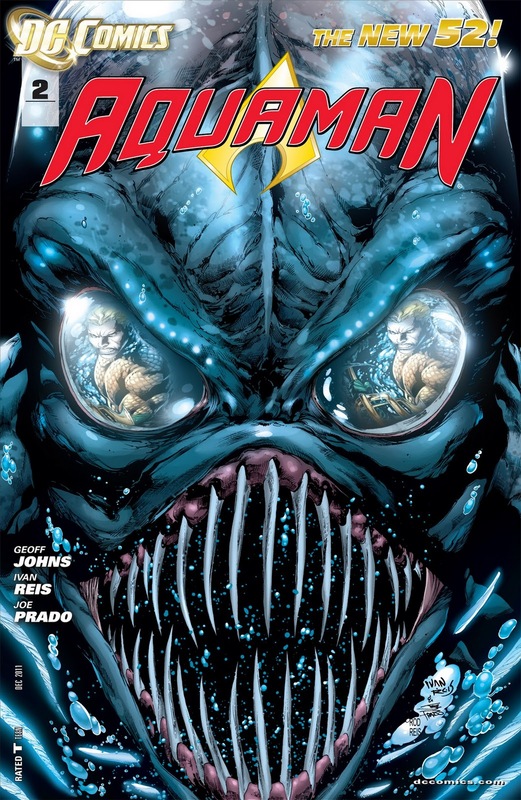 Aquaman continues to be high on my reading list.